The extra detailing is not a waste at this scale. Even with everything closed up, shine a light (using your smart phone) and you can see all that glory up close! Cockpit looks fantastic! That's looking nice and busy, just as it should. Some mighty fine work in the front office. 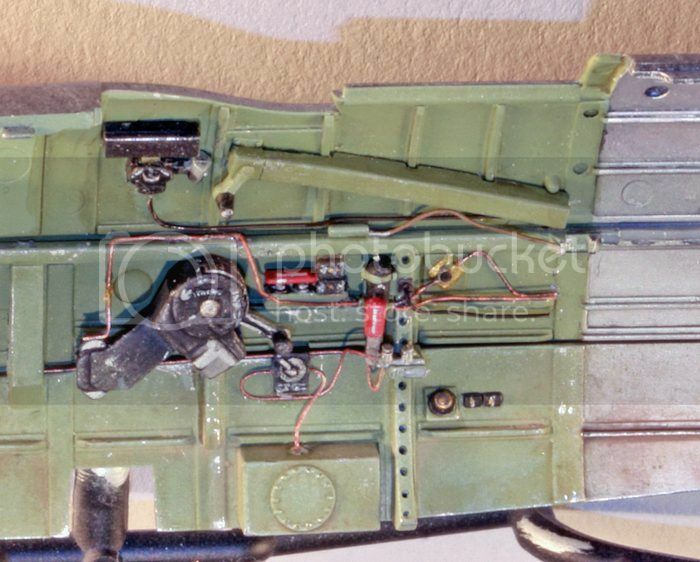 For step 13 we tackle the rhs cockpit wall and the MkII gyro gunsight. 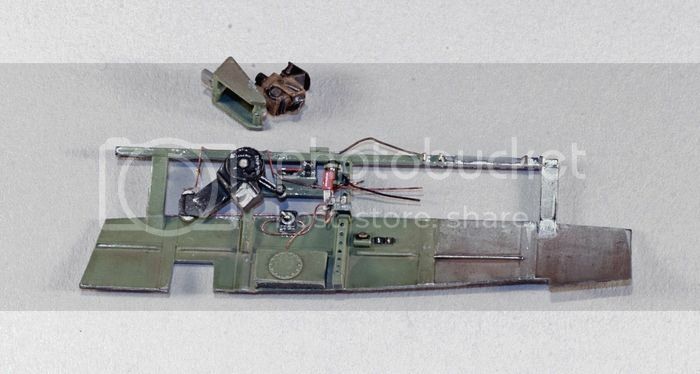 Tamiya would have the builder assemble the whole cockpit tub before installing this sub-assembly inside the fuselage. Using this process requires a little lateral thinking however as there are a couple of pipes that run from the gear retraction lever over the forward IP bulkhead. I chose to attach them to the bulkhead and bend them into place so that they sit properly after the assebly is together. We also get to build the gunsight which consists of seven parts! For something less than a centimetre square that's alot of parts. I think other kit manufacturers would have made it in two parts, maybe three. I decided to add some pipes and wires but much of the extra detailling is hidden by the seat as Don warned it would be. I think I'd better a get a torch as Shaka suggested. The fuel tanks that fit behind the seat are beautifully crisp bits of plastic which are entirely hidden once the seat armour and headrest armour are in place. So with this done, now it gets exciting. Step 15 is assembling the fuselage. 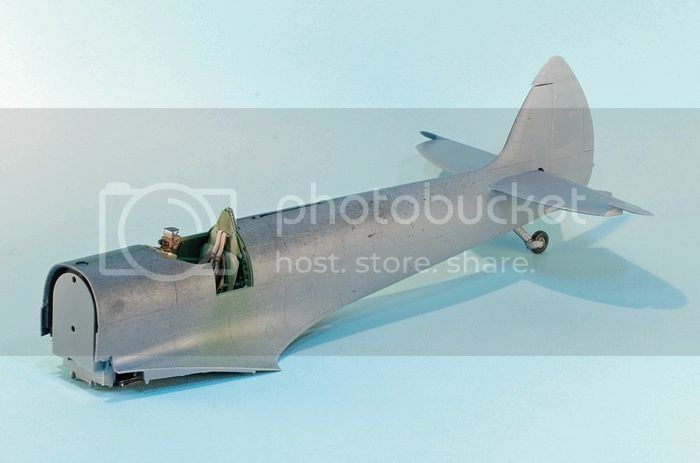 Yeahhhhh......... that gunsight......The cockpit looks fantastic, Guy!! Additional details really look great. 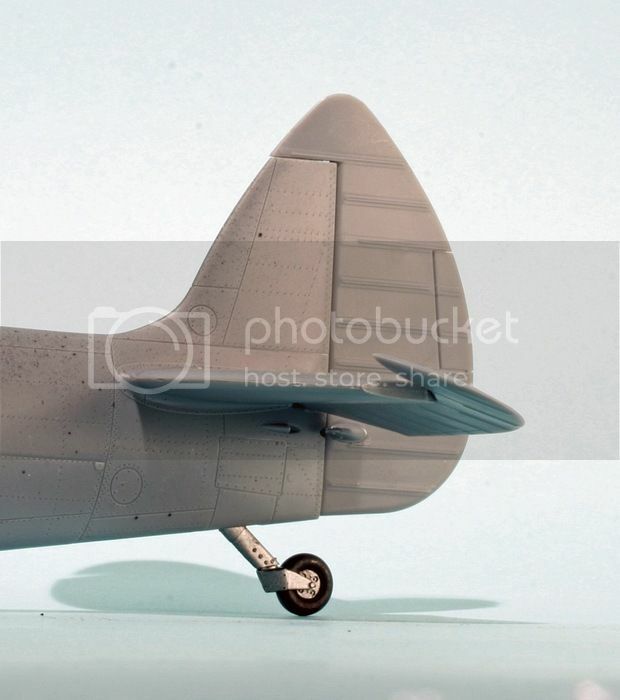 If any model kit deserves a clear fuselage, these Spitfires do. A great build Guy, really enjoying watching it unfold. Funnily enough your list of "difficult" things is similar to and as long as mine! So why do we build models? Dude, that pit looks sooo good -- I'm more than a bit envious! Excellent work, Guy! Looks great so far. I think you'll find it barely needs any filler once you have the fuselage together. Thanks Don. The gunsight is a mini model in itself. Although the colour callout is for black I chose the colour based on a reference photo. I've little doubt that the detail on a resin version would be crisper but this looks ok I think. So why do we build models? Hey Shaka, thanks man. That means alot as I've seen just how good your stuff is. Hi Kev, I appreciate your support and motivation, cheers. Hi Carl, I hear you. That is one of the pleasures of building these magnificent Tamiya kits in my humble opinion. Talking of closing the fuselage, step 15 has us doing just that. As Carl mentioned this went together beautifully. I've yet to clean the seams but it all looks ok at this point. Steps 16-19 have us constructing the rudder and horizontal tail surfaces. These trap a metal bar and etched hinges between the two plastic halves to allow movement. One thing that I've found curious is the instruction to remove the link rod from the rudder actuator. I'm guessing this is to allow free movement of the rudder but it is n't prototypical unfortunately. I'm not a huge fan of working parts but the way Tamiya engineer it the fit is exemplary. 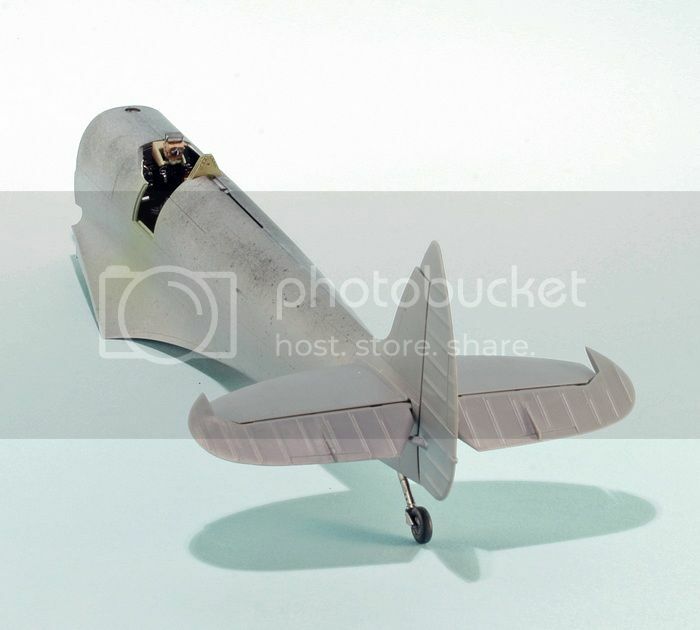 Step 20 sees the horizontal tails and rudder fitted along with the tail wheel assembly. That slid neatly into the mounting point that was trapped between fuselage halves in step 15. 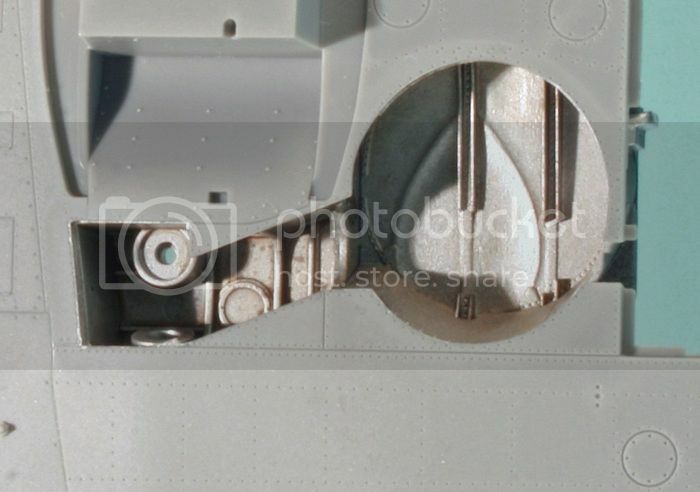 In the above photo you can see where the rudder control rod is missing. 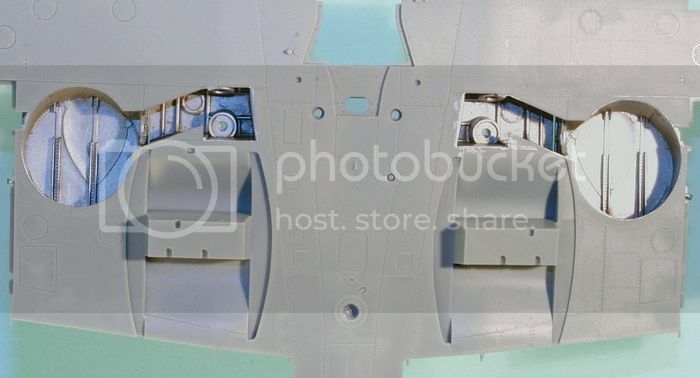 Step 21 is opening holes in the wings for the wheel bay blisters (option C) or bomb racks (option B. ) plus nipping off a small portion of the wheel well opening. Stes 22-24 allow us to assemble and add the wheel bays to the lower wing and the brace that helps set the dihedral. Another neat touch by Tamiya. 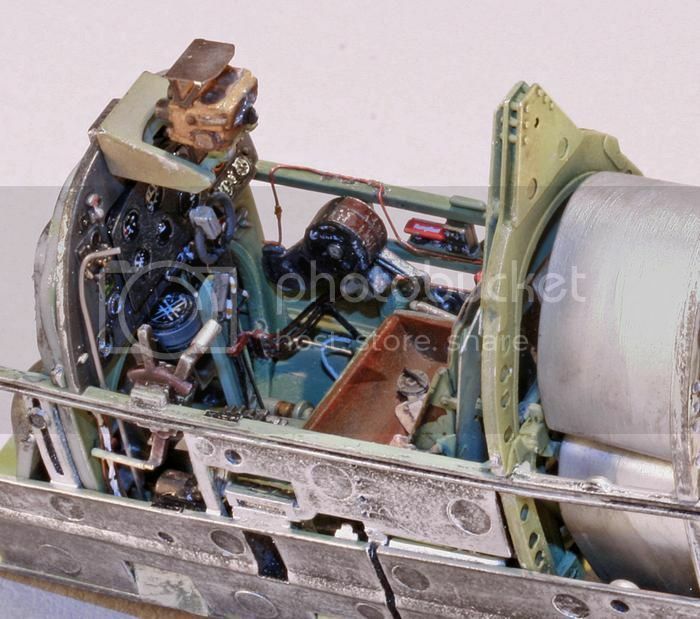 I've used silver for the interior of the wheel bays as that is the underside colour of the airframe I intend to model. I spattered some oily shades into the wheel bay toward the leg mounting point to suggest a certain amount of use but kept the main portion reasonably clean. Just a little dust in the corners. 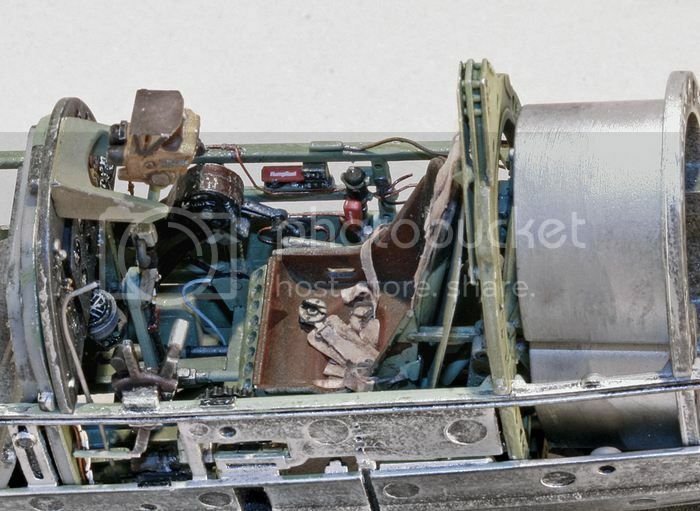 From what I can make out there is n't much going on in the Spitfire's wheel bays. I may add a hose or two later if the need arises. The next raft of steps involves assembling the main wings so I'll be back next time with news of how that went including how those pesky cannon mounts fit. That's really starting to look Spitfireish. For the rudder link rod, I actually left mine on and instead drilled a small hole in the fairing on the fuselage where it should connect to. This way it can fit in and not have a disconnected look. Since you've already removed yours, maybe replace it with a small metal rod?